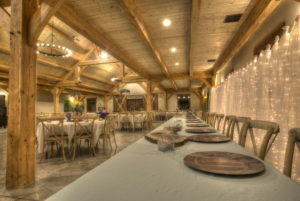 – access to our indoor timberframe venue Friday from 3pm to 10pm for decoration and/or rehearsal/rehearsal dinner. 7am to midnight Saturday. 8am to 2pm Sunday. – setup and tear down of up to 300 chairs for inside plus tables. Indoor chairs are a very nice wood x-back wedding chair. – integrated professional indoor sound system with 4 individual zoning controls plus a 5th zone for our outdoor patio area. Our sound system will outperform any mobile DJ setup and ensure your guests never miss a word during your event. 8 – 8″ in ceiling speakers, 8 – 12″ in ceiling speakers, and 4 – 18″ powered subwoofers to really shake the dance floor. Your DJ will only need his mic and mixer or mic only if he prefers to use our mixer. – built in bar area with 2 keg cooler, bottle cooler, 3 tub sink. – open vendor policy for your convenience. Our vendor policy is a true open vendor arrangement. There are no preferred vendors or lists and no up-charges or percentages paid to us. The arrangements are strictly between you and the vendors you choose. Our Two day package includes all of the great options above with access beginning 3pm on Friday through midnight on Saturday. Overnight stay option is included Friday night only. Our Sunday package is a great way to save. Single day rental with all of the great facility features above. You will have access to our facility from 8 am until midnight for the single day package or 8am Sunday to noon on Monday for our Sunday overnight stay package. 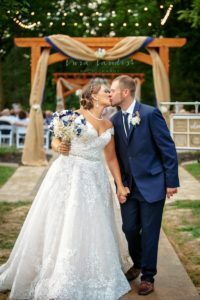 If your looking for a truly unique event we hope you will consider Timber Creek your venue of choice. 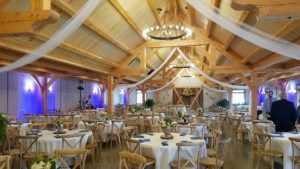 Give us a call or drop us a message if you would like to discuss your next event or schedule a visit.